Xandros Corporation has announced the release of Xandros Desktop 4.1 (marketed as Xandros Desktop 4 Professional): "Xandros, the leading provider of easy-to-use Linux alternatives to Windows, today announced the addition of 'Xandros Desktop - Professional,' featuring advanced 3D desktop graphics effects, Bluetooth wireless support, desktop search and ISV support." The new product is based on Debian 3.1 "sarge" and includes the latest kernel 2.6.18, KDE 3.4.2, Firefox 2.0, CrossOver Office 5.9.1 and many other software applications for the desktop. 3D video effects with Xgl/Compiz and the Beagle desktop search tool are among the new features included in the distribution for the first time. Please read the press release and visit the product's feature page for additional information. Xandros Desktop 4.1 is available for purchase and immediate download from the company's online store (US$99.99). Xandros Corporation has announced immediate availability of Xandros Desktop 4, a novice-friendly desktop Linux distribution based on Debian GNU/Linux: "Xandros, the leading provider of easy-to-use Linux alternatives to Windows desktop and server products, today announced a new line of consumer desktop products targeting home and multimedia users: Xandros Desktop Home Edition and Xandros Desktop Home Edition - Premium." Read the official press release and visit the Xandros product pages to learn more about the new release and to see a handful of screenshots. The two editions of Xandros Desktop 4 are available for purchase (and immediate download) from the company's online store; the links: Home Edition (US$39.99), Home Edition Premium (US$79.99). Mad Penguin has taken a thorough look at the brand new Xandros Business Desktop 3.0, released last week: "How many distributions available today have the functionality it takes to be a part of a full-fledged Windows domain? The answer is simple: One. Xandros understands this growing requirement and has been developing around it for quite some time now. As a matter of fact, Xandros stands as the only Linux distributor that seems to make it their primary goal. Others may claim that they are providing the ideal Windows-friendly distribution, but until they can show me a simple way to join a domain (Windows NT legacy and Active Directory), connect to network drives and have the choice to make them persistent over reboots, connect to shared printers, and manage users... I will never consider them ready." Read the rest of the review with screenshots. Xandros Corporation has released Xandros Business Desktop 3.0, an "instant alternative for Windows business desktops": "Xandros, the leading developer of easy-to-use Linux alternatives to Windows, today announced that it is shipping version 3 of the Xandros Business Desktop operating system. The new business desktop provides seamless compatibility with the latest Windows servers, including domain authentication support, logon scripts, and group policy profiles. Xandros Business Desktop is available now for purchase in retail stores and from the Xandros web site for a list price of USD $129.95." More details about the product can be found in the press release and on the company's product pages. To buy the product please visit the Xandros Store. India's Techtree has reviewed the free edition of Xandros Desktop OS 3. Their conclusion? "Linux is not ready": "Everything in Xandros on the surface worked so well - browsing the web, checking email, playing music and movies... But when you try to install new applications, you get screwed. Frustrated. And you want to boot back into Windows. Yes, there is Xandros Networks - the online software repository for stuff that's tweaked and tried and tested to work with Xandros, but obviously they won't let you download a CD burning tool that bypasses the 4X limitation that they put in the first place... Xandros is good, but it's not ready. But that's not Xandros' fault. Linux is not ready." The 3-page review with screenshots starts here. DesktopOS has published a review of Xandros Desktop OS 3: "The desktop environment is a Xandros enhanced KDE version 3.3. It has most of the features that everyday users would come to expect from a modern operating system such as Microsoft Windows XP with Service Pack 2, Plus XP, & Office XP. 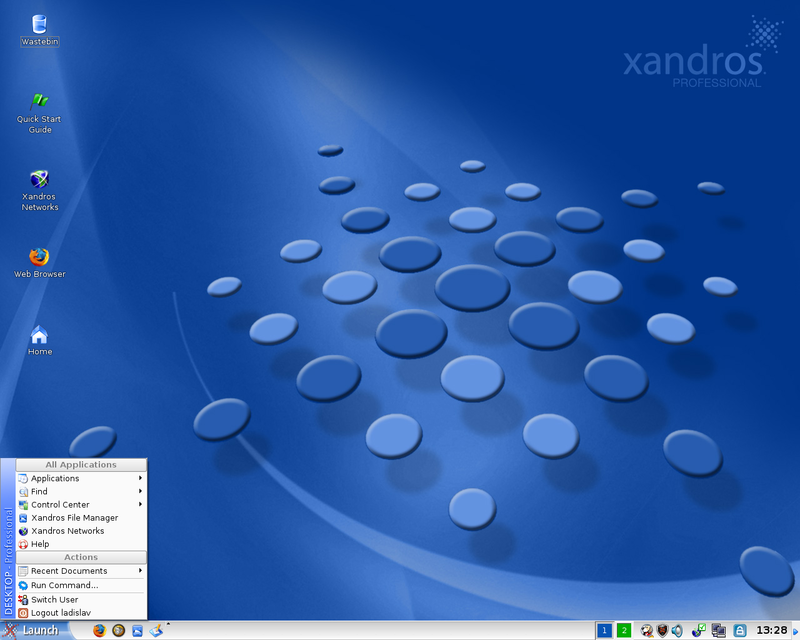 The Xandros development team has customized KDE to make things more user-friendly. Software like XMMS, Xine, OpenOffice.org 1.1, and Mozilla web browser 1.7 are included and have been customized also. The Xandros visual appearance has improved dramatically in version 3.0 to be more much attractive then it was in version 2.x. In saying that at least Xandros make the effort to customize the desktop, which is more then many other Linux desktop organizations do." Read the rest of the review here. Xandros Corporation has released a freely downloadable edition of Xandros Desktop 3: "Xandros, the leading developer of easy-to-use Linux solutions, today announced the version 3 release of the Open Circulation Edition of its Linux desktop operating system (OS). The new release provides a new Internet experience with Firefox web browsing, Skype Internet calling, and Thunderbird e-mailing. The Xandros Open Circulation Edition is available for download at no charge from the Xandros web site." Here is the full press release. The ISO image is provided for download in the form of a BitTorrent seed, available from here: xandros-301-ocd-installation.zip.torrent (540MB).